VergesRome Architects was retained by Saint Joseph Abbey and Seminary College to assist with their Strategic Plan, looking ahead to the next 100 years for the monastery and seminary, focusing on future and existing facilities, site planning, and protection of the Monastery’s cloister. Multiple stakeholder groups and the Strategic Planning Committee worked collaboratively to achieve a unified vision of operational, educational and facility goals. 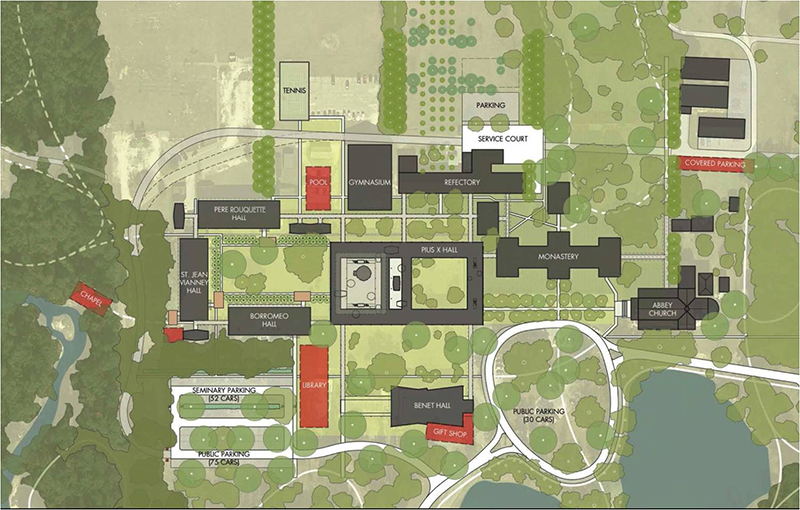 VRA collaborated with nationally renowned Landscape Architect, Reed Hilderbrand, integrating proposed architectural building conversions and renovations with planned improvements to campus pedestrian and vehicular circulation, site lighting, and creation of special landscapes throughout the campus. A new chapel for seminarians is in design for a wooded site overlooking the river behind Vianney Hall. The design will correspond to the campus’ Mid-Century Modern vernacular – clean and clear aesthetic, materials, and scale that support contemplation, vocation and prayer.